Jim McKay was from the old school. He didn’t try to make himself bigger than the events he covered; hell, apart from the introduction he often didn’t even appear on camera. But when you heard his voice, you knew something important was on – even if it was just a demolition derby in Islip, New Jersey. Because it was Jim McKay calling it. I mention the demolition derby because McKay gives it a prominent spot in his autobiography, The Real McKay. Not so much for anything memorable that might have happened, but because of what it taught him about covering sports. Interviewing the winner, McKay was inclined to treat the whole thing as a lark. But it was no lark to the winner, who had just won his sport’s "world championship" and discussed his strategy as seriously as would any other athlete. McKay learned a valuable lesson that day: "I had committed an unforgivable bit of gaucherie, looking down on this man in a condescending manner during what he considered the greatest moment of his life." From then on, McKay said, he tried to approach all sports "through the eyes of its competitors." I might add that, successful as he was in approaching the sports he covered through the eyes of the participants, Jim McKay was equally successful at approaching them through the eyes of the viewers at home. We often hear about games “being brought into the living room of the viewer,” but McKay had an even greater talent – a gift, really – for bringing the viewer into the stadium, allowing them to appreciate the sights and sounds of places as exotic as Monte Carlo and Rio De Janeiro, and as ordinary as McKeesport, Pennsylvania and Hayward, Wisconsin. McKay the writer is equally adept at taking the reader to these places; The Real McKay outlines McKay’s career from its beginnings in Baltimore, where the young Jim McManus started out covering airport openings and hosting afternoon variety shows, to his time at CBS, where the prospect of a dead-end career hosting the courtroom drama The Verdict Is Yours threw him into a bout of depression, to the lifeline that came his way with the offer to host a new, summer sports anthology series on ABC: Wide World of Sports. The rest, as they say, is history. *And if you think Jim McKay wasn't a real journalist, that he might have been in over his head covering a breaking news story, read the forward from his friend and colleague, Peter Jennings, who knew a thing or two about journalism. 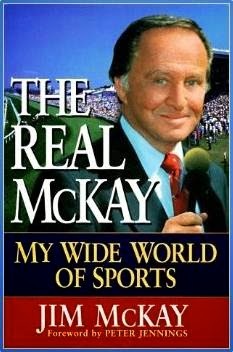 The bulk of The Real McKay consists of the author sharing the most memorable moments and personalities from his long broadcasting history. And what a history it was: the Olympics, the Masters, U.S., and British Opens, the Indy 500, the Grand Prix of Monaco and the 24 hours of LeMans, the Grey Cup, the World Cup, the Kentucky Derby, Wimbledon, figure skating, track and field - how's that for starters? Again, many of these events will be familiar to sports fans, such as the gymnast Olga Korbut’s memorable splash on the world scene in those 72 Munich Olympics. But even more entertaining are his portraits of athletes that might be lesser-known today, such as 1961 Formula 1 World Driving Champion Phil Hill, with whom McKay teamed up on a memorable vintage car rally in Brighton in 1967. McKay rarely turns the spotlight on himself, preferring instead to discuss the amazing life he’s lived, the things he’s seen and heard around the world, but when he does turn inward, it’s mostly to McKay the family man, referring to he and his wife Margaret as "a team," and crediting that "team" for much of his professional and personal success. He understood that hard work was essential to a successful marriage and family, and believed that a common faith and shared interests had much to do with it. He was proud of his son, Sean McManus, who became president of CBS sports and news, and equally proud of his daughter Mary, a counselor. Of the life he and his wife shared, he wrote, "There is little more we could ask for." The Real McKay is the perfect biography: it not only tells you about the man, it also entertains you with the stories of his life and times. You feel as if you know him; at the very least, it makes you want to have known him. It’s not a heavy book; you should be able to polish it off over a long weekend if you want, and it makes a very good summer read. I found it on the sales table myself, and I don’t think you’ll have too much difficulty tracking it down through your local or online used bookstore. A last thing, and this is really more about Jim McKay the man than the book he authored. When we’re kids, many of us, we’re fearless. That extends from pretending to be a superhero and jumping off the garage roof with a towel tied around our necks, to writing fan letters to athletes and other celebrities. Sometimes something happens, though, as we grow older – people and events become more remote, we put people on a kind of pedestal, we think they’re untouchable. The blogosphere has done a lot to ameliorate that, to spread a kind of egalitarianism that closes the gap between the famous and the ordinary, but for some of us, especially from the old school, it still exists. And then you learn, often after it’s too late, how accessible many of those untouchables were, and how many people were able to benefit from it. Jim McKay’s book made a real impression on me when I read it; it made me admire a man I already liked, and reminded me of just how much pleasure he’d given me through all those years, and how he seemed to grow in stature even more after his retirement, in comparison to the relative pygmies that replaced him. I thought about writing him, to tell him that; I wouldn’t have needed any kind of a reply except perhaps an acknowledgement that he’d received my words and understood the impact he’d had. I never did, and now of course I’ll never be able to. It wasn’t the first time I’d missed that kind of opportunity, and it probably won’t be the last. And let that be a lesson to you: nobody is that unapproachable. If someone moves you, if something really strikes home with you, changes your life, or even gives you that moment of pleasure, let them know. Make a connection with them. Even if you never hear back, you’ll have made the effort. But I wouldn’t be a bit surprised if you did get an answer; the few people I’ve connected with have turned out – surprise! – to be almost as ordinary as I am. I’d like to think that my expression of appreciation would have meant something to Jim McKay, would have given him a moment of satisfaction (as if he needed it!) at the millions of people who’d listened to and watched him throughout the years, and whose lives he’d become a part of, even if for only that moment. In the meantime, give this book a read. I think the Demolition Derby you referred to was in Islip, New York, (on Long Island) and not New Jersey. For many years, the owner of that track invited demolition derby winners from around the country there every fall for a World Championship Demolition derby which was a "Wide World Of Sports" staple for decades!